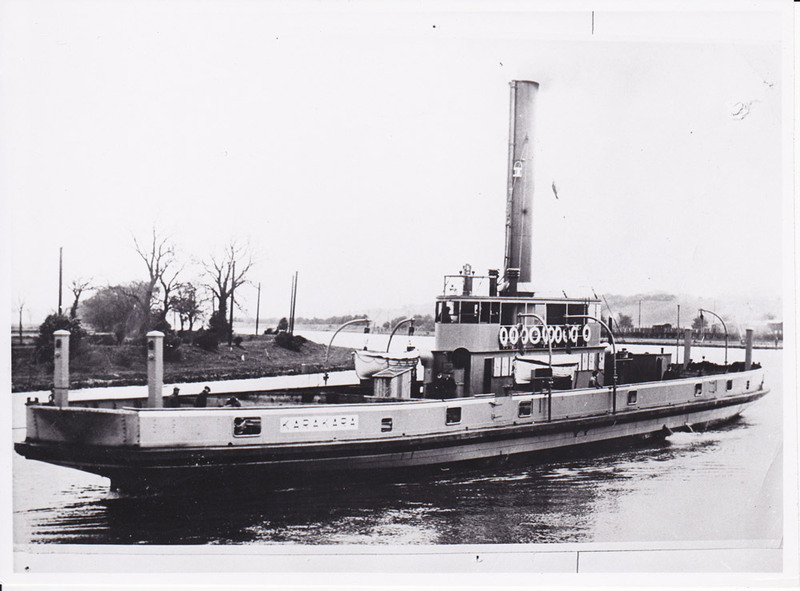 The steel vehicle ferry Kara Kara was built for a special service which was discontinued after the opening of the Sydney Harbour Bridge in 1932. 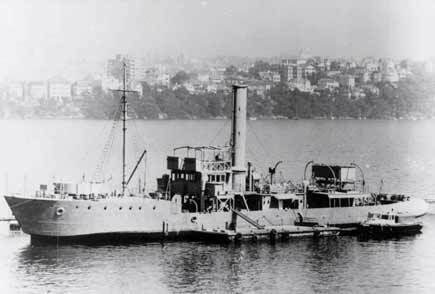 She was then laid up and maintained in anticipation of an expected requirement by her owners, Sydney Ferries Ltd.
On 27 February 1941 Kara Kara was requisitioned by the RAN for naval service and was subsequently purchased on 6 January 1942. HMAS Kara Kara was aquired by the Royal Australian Navy for service as a boom gate vessel. After fitting out as a boom gate vessel and commissioning, she departed Sydney on 23 October 1941 for Darwin, where she arrived on 14 November 1941. She took up duty immediately on the maintenance of the Darwin boom defences and served in that capacity almost continuously until mid-1945. Kara Kara came under heavy air attack at Darwin on 19 February 1942, when the Japanese Admiral Nagumo's carrier borne aircraft made the first enemy attack on the Australian mainland. She suffered several casualties, including two ratings killed by machine gun fire, and was fortunate to escape serious damage. On 8 December 1945 Kara Kara paid off into reserve at Darwin. After five years in reserve she departed Darwin on 6 December 1950, arriving at Sydney on 22 December 1950. Without further sea going service she was transferred to unmaintained reserve at Waverton Depot on 30 December 1960 and was later used as a Reserve Amenities Ship at Sydney. 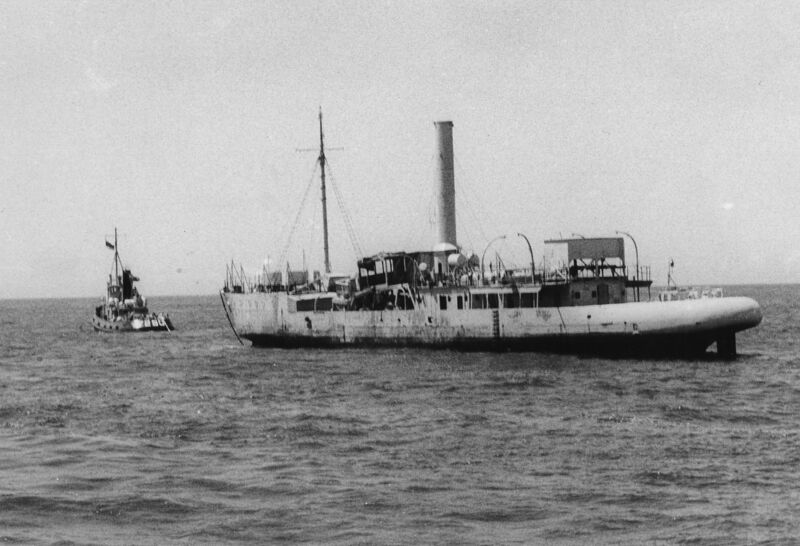 When Darwin came under air attack in October 1941, HMAS Kara Kara suffered several casualties and was fortunate to escape serious damage. Kara Kara was sold on 15 February 1972 to Marrickville Metals, Marrickville, NSW, for breaking up. After being stripped of useful material the hulk was handed back to the RAN for use as a target. On 31 January 1973 Kara Kara was sunk, forty miles east of Jervis Bay, as a target for RAN ships and aircraft.